There’s vigorous energy to the work on display in Mark Hearld’s exhibition at the Scottish Gallery, reflecting the subjects on the show: the busy natural world of birds, dogs and other animals, with striking profiles, depicted in amplified, resonant earth-palette colours, and showcasing a bold and instinctive compositional talent. Born in 1974, and based in York, Mark studied illustration at Glasgow School of Art and gained his MA in Natural History Illustration at the Royal College of Art, so the word ‘natural’ applies to his work in every sense: there’s an energetic involvement evident in the mastery of the media he employs. The work here in the exhibition is primarily cut paper, some of it custom-made and printed by the artist, employing a flour-water-paste technique that excites him in the way it holds textural marks. 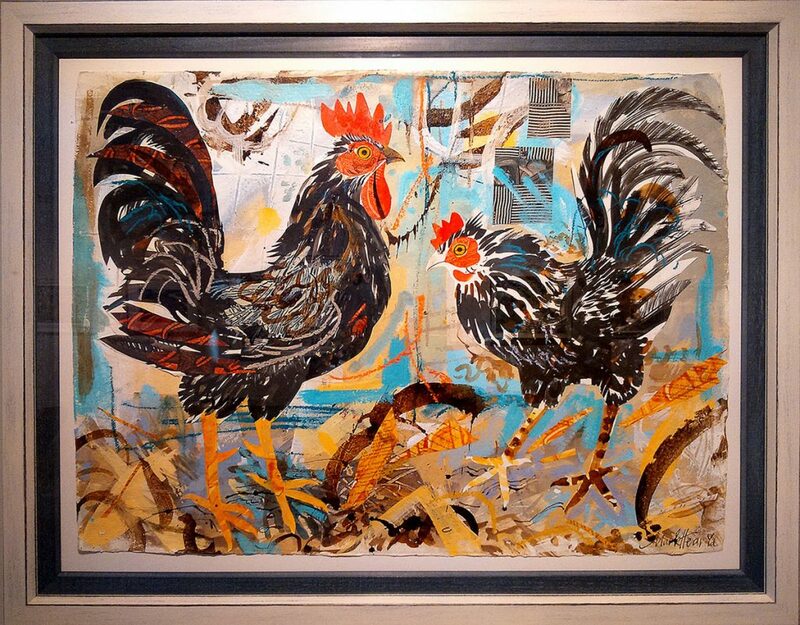 This is carefully layered in collage and over-marked, building-up compositions that mix figurative and abstract elements. You notice that often he applies paint to the picture-frames, which adds to the vibrancy particularly of the larger pieces, for instance, ‘Leopard’, the ‘Muscovy Drake’ and ‘Muscovy Duck’ or ‘Young Black Shouldered Peacock’ (in the exhibition booklet Mark cites an interest in rare breeds of fowl awoken by a recent visit to a Staffordshire poultry fair). 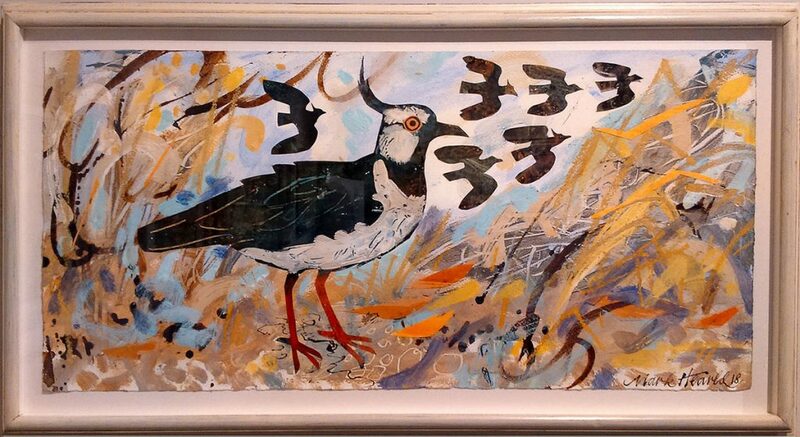 It’s friendly, rich, characterful and decorative work – some pieces, such as ‘Redwings’ and ‘Lapwing’ have a movement and naturalistic setting to them that lends a wistful beauty that’s less evident in the more plainly decorative works, such as ‘Finches’ I and II. It’s very much in the tradition of English 20th-century craft, and no surprise to detect the strong influence of artists such as Edward Bawden, John Piper and Enid Marx in the compositions and colour, and like them, he works in a range of media – paint, print, collage, textiles and ceramics. Little surprise also that within a few days of the exhibition’s opening, when I visited, nearly all the pieces had sold, and chatting with the Gallery’s Managing Director Christina Jansen, I learnt that the display has attracted visitors from remarkably far afield. While the larger works reach 75cm wide, the smaller works act as an interesting counterpoint: at only 6cm square the shapes are cruder, the textures less detailed and the layout necessarily simpler, taking on a different character to the larger pieces. Another variation – evident in works such as ‘Small Holding Dovecot’ or ‘Swan Bank’ – is that diminishing the foreground figures allows the surrounding and background textures to assume a heightened visual prominence, encouraging the eye to wander around the space rather than being drawn to the centre. 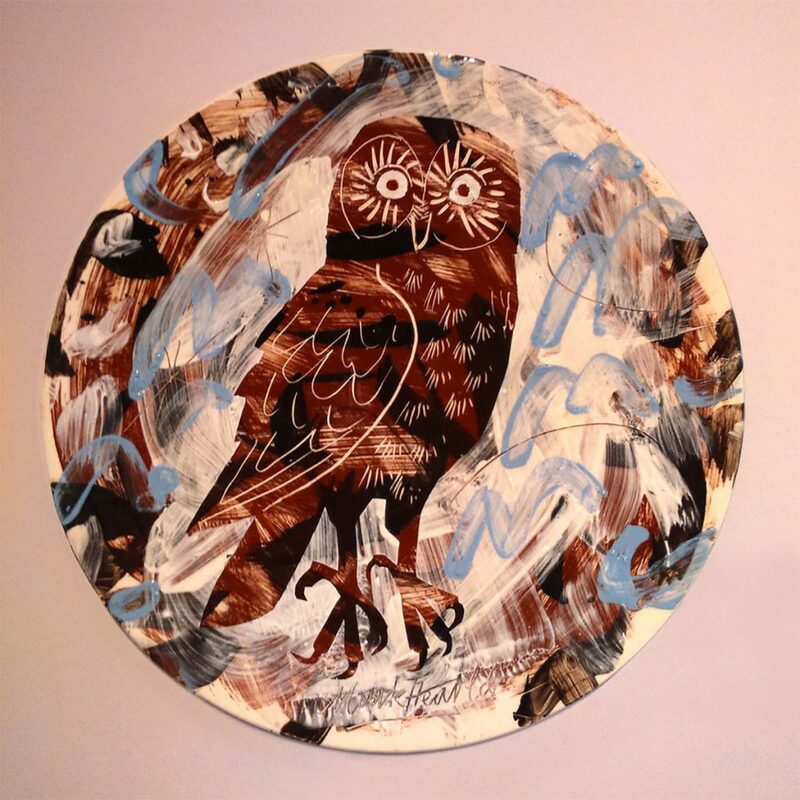 The ceramics on display, especially the ‘Owl’ and ‘Parrot’ platters, use a much-reduced palette, starker than the paper works. Again, the eye adjusts, impressed more by the form and minimal colouring – some of the recent platters such as ‘Fantail Pigeon’, approach monochromatic. Moving further round the exhibition, Hearld’s versatility is evident, as an illustrator (the Ted Hughes book ‘What is the Truth?’, along with copies of other books illustrated by Hearld, are on sale at the Gallery), as a designer, with fabric and wallpaper work he has undertaken for St Judes, the craft and print publisher, and as a printer (a short video, made by St Judes in 2011, offers a useful insight into the artist’s influences, approach and techniques). Hearld’s black hand-script is also widely evident, including for instance on the invitation to the exhibition’s private view (on sale for £1, which goes to MND Scotland). As part of the exhibition, alongside Hearld’s work, there are presentations by his ‘fellow-artists’ Malcolm Appleby (silverware and jewellery), Ben Arnup, Clive Bowen, Joe Hogan (ceramics), Paul Preston (basketwork), Guy Royle (jewellery – some sporting impressive designs by Hearld) and Samuel Waterhouse (metalwork).